Given the time of year I thought a visit to a number of, newly cleaned, churches might be in order this week. My first was Christchurch, Spitalfields, Hawksmoor’s chunky masterpiece (take the Central line to Liverpool Street station, cross Broadgate and head towards Commercial Street). Currently gleaming white, Christchurch almost didn’t survive many years of neglect until its restoration, not to say resurrection, in the 1960s. This has only recently been completed at a cost of £10m.. Built between 1714 and 1729 as one of the churches of the Fifty New Churches Act of 1711, Christchurch’s huge spire amply fulfilled the requirements of the Act and it still towers over the surrounding area. 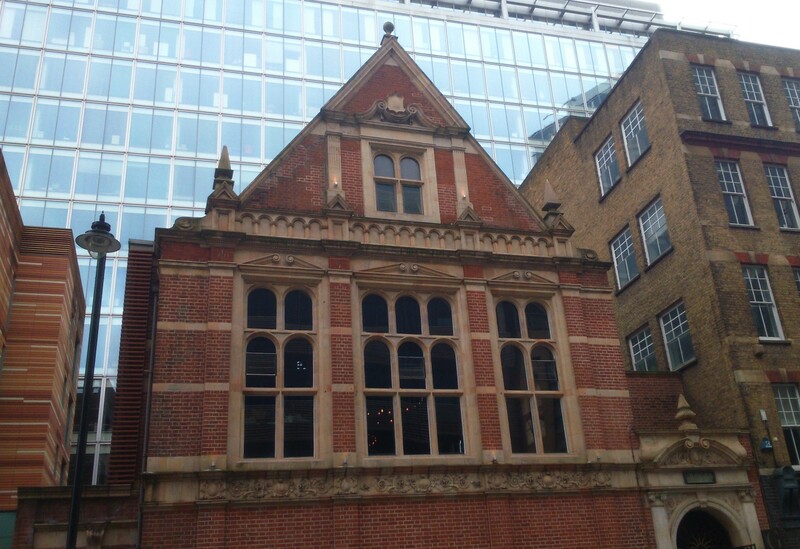 At the time of building it would have towered over the non-conformist churches and chapels of the French Huguenot silk-weavers who were populating Spitalfields in the early 18th century. This was the intention of those who sponsored the Act. The godless masses were to be cowed and brought within the fold (and woe betide any of those pesky non-conformists, who would be made to look up at a true Anglican Christian edifice). 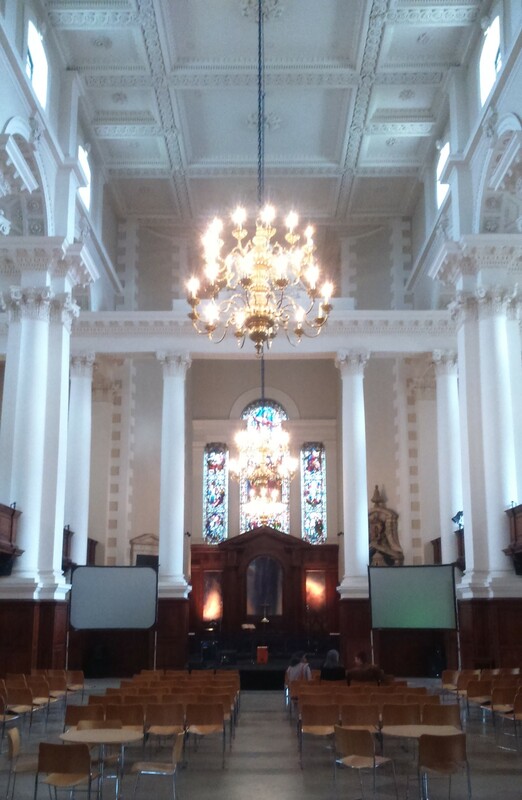 Preachers here include John Wesley ( so much for over-aweing the non-conformists ) and the 18th century curate Samuel Henshall, inventor of the modern cork screw. When Mr Henshall eventually died, he owed, it is said, £400 to his wine merchant. More recently, in the 1980s and 90s, works within the crypt led to the excavation of over 1,000 bodies. Suspicion that this was a newly unearthed plague pit led to press and public speculation about the longevity of the plague carrying bacillae. Needless to say, modern London was not troubled by a replay of the Black Death. 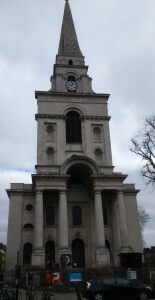 Today the church often hosts public performances of music and the art of locals, Gilbert & George. Entry is free though the church is only open at certain times – check the web-site. Interestingly, Christchurch shares with the second of my churches the lack of interior pews. 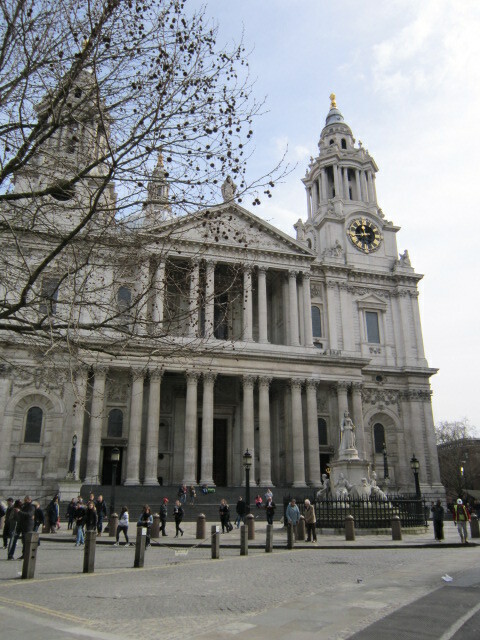 The new St Paul’s Cathedral, a stunning monument not only to the Saint, but also to Sir Christopher Wren its creator, has always been an open church. So much so that, in late 18th century the men of business who thronged the western part of the church implored the church authorities to heat it – hence the brass floor grills which can be seen today, through which heat from hot coals down in the crypt would pass. It too is gleaming white, after ten years and £62m worth of cleaning and restoration. Built after the Great Fire on a site occupied by a church dedicated to St Paul since AD604, this building is only the latest in a series of phoenix rising from the ashes. It is, however, the crowning glory of Wren’s prodigious church-building career, in which he was often helped by his assistant, Nicholas Hawksmoor. Wren also managed to find time to build so much else – the Monument, large parts of Hampton Court and Kensington Palaces, the Wren Library at Trinity, Cambridge, the Royal Naval Hospital at Greenwich… and the list goes on. He is buried in the crypt and his epitaph asks its readers to look about them for his monument. What better? Thank you to Eileen, my guide on this visit, who was most knowledgeable about ‘the people’s church’ (no royals), although she isn’t a fan of the most recent installation, a piece of video art by Bill Viola. At the end of the south Quire Aisle there are four oblong video screens, each showing a person in extremis, not a comfortable piece of art, but particularly appropriate at this point in the church calendar. Readers will not need me to tell them more about St Paul’s or the famous people interred beneath the massive flagstones in the crypt. It is so much the museum or public monument these days that it charges £17.50 for entry (£15.00 concessions) though worshippers are provided with a separate side chapel with free entry. My visit there preceded Palm Sunday and we were treated to Eileen’s description of the Palm Sunday Parade from Paternoster Square to the High Altar, complete with live donkeys (who only get as far as just inside the West Door, for fear of ‘accidents’). 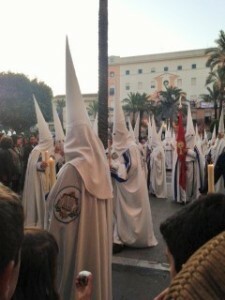 This is, however, restrained compared to Christian celebrations elsewhere, most particularly in southern Spain, where Palm Sunday begins Semena Santa (Holy Week). 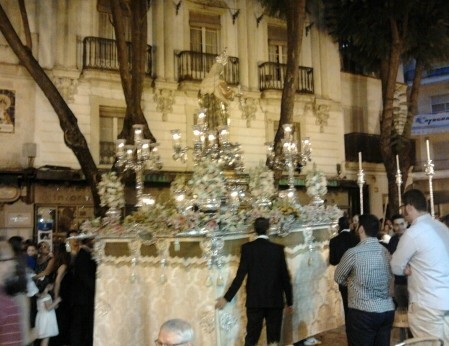 I was in Jerez at this time last year and witnessed the daily parades of penitents from the ancient churches and chapels of the town, complete with bands, choirs, watching masses and especially published programme. 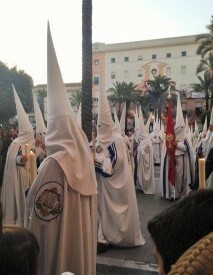 It is impossible to move during some of the processions – I can attest to being flattened against a stone wall for about ten minutes while a black-clad procession of bare-foot penitents, complete with huge candles, singing children and massive paraphernalia, including an enormous statue aboard a shoulder-height bier, similar to the one pictured below right, was stalled for a while. The men bearing the heavy bier were negotiating, bit by bit, a ninety degree turn in the narrow street and the whole procession backed up. Churches parade every day from about six in the evening to one in the morning and no church parades more than once. All roads in the centre of town are closed and on Good Friday the parading continues throughout the night. This amazing communal spectacle is free, but get there early to avoid disappointment, as they say, the streets are very. very crowded. On such occasions I enjoy looking out for interesting juxtapositions between the ancient and sacred and the modern and practical. Sitting in a café, we watched a participant, resplendent in red robes and obviously already late, trying to affix his pointed hood while rushing along the pavement. He failed to take account of the café awning under which my party was sitting. Cue much decidedly unreligious language, then a rapid re-attempt to don the headdress which, we saw, was lined with the iron-on starch once commonly used for shirt collars, the better for it to retain its shape and remain aloft. He smiled, sheepishly, as he hurried on his way. But back to London and my final church (left), which is exactly the sort of non-conformist chapel which Christchurch was designed to out-shine, though constructed much later. 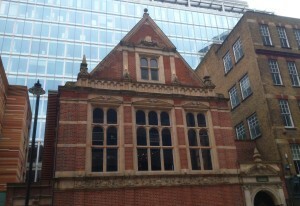 It sits in Spital Square just north of the old market and its red-brick and stone mullioned windows are newly scrubbed. Its latest incarnation accommodates a modern restaurant, where a good Sunday lunch may be had for £35 per person. 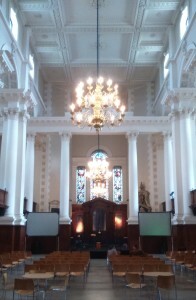 There is a galleried area, as well as the main body of the former chapel, for dining and live jazz on Sundays. It was enjoyed by all the party. Garden in the Sky Amazing Grace…. This entry was posted in History and tagged Worth a visit by juliej. Bookmark the permalink.